Visit The Aegean’s official Destin Condo Rental agency for more information about Destin condo discounts & specials! There are unlimited opportunities to enjoy water sports on the Emerald Coast. Destin offers Pontoon Boat Rental, Personal Watercraft Rental, Powerboat Rental, Hobie Cat Rental, Sailboat Rental, Boat Rides and Parasailing. The Destin Harbor sports the majority of Boat Rentals, however there are also several locations on the Gulf and in the Harbor to choose from. Additionally, The Sandestin Beach and Golf Resort features many of the above amenities within their gates for resort guests. 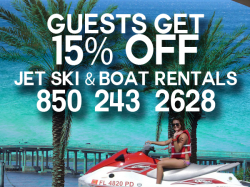 Guests who book with us get 15% OFF Destin boat rentals and Jet skis at Wet N WIld Watersports. The crystal clear waters of the Gulf of Mexico provide some of the best diving found in the United States. Destin is one of the few areas in Florida where you can snorkel right off the beach without a boat. Don’t miss the Crystal Beach Pier and the Destin Jetties! There are also numerous natural and artificial reefs in the Destin area that are excellent for spear fishing & shelling. Several Destin locations offer everything you will need to enjoy diving on the Emerald Coast, including courses, equipment and diving & snorkeling trips. Since Destin is such a water-based community, here are some helpful hints to ensure you have a safe and pleasurable boating experience. These tips come in handy whether you are an inexperienced or an expert boater. This information was supplied courtesy of the Local United States Coast Guard Station, who can be reached at 850-244-7147. Where will you launch your boat from? What signaling equipment do you have on board? Do you plan to make any stops at marinas or restaurants? Don’t drink and drive. Use a designated driver. The marine environment with its wind, current, waves and resulting fatigue pose a significant challenge even to experienced boat drivers. Familiarize yourself with the local area. Know where the no wake and idle speed only signs are and obey them. Certain areas are designated because of boating congestion where collisions are a threat, and to protect valuable property that could be damaged from excessive waking. You are required to have a lookout at all times when boating. The lookout should keep the operator informed of all possible hazards. Familiarize yourself with the safety equipment requirements for your size boat. Your local Coast Guard Auxiliary can conduct a courtesy exam free and issue a decal once you meet all the requirements for your boat. Make sure your navigation lights work prior to going boating at night. Navigation lights are required to be displayed from sunset to sunrise. Ensure there is a life jacket for each person on board and that it fits. Protect our environment. It’s the only one we have. Report polluters to the Coast Guard and Florida Marine Patrol. If you encounter someone who needs assistance lend them a hand. Placing a radio call for someone can save a lot of time and money for those in distress and the search units. For more information contact your local Coast Guard Station for federal requirements or the Florida Marine Patrol for state requirements. Safety flags are posted at all public beach access points, be sure to check the surf conditions prior to entering the water. Walk along our 24 miles of powder-soft beaches and you’ll quickly forget the cares of your everyday world. Our soft, white sand is sculpted from Appalachian quartz so pure, that walking through our Gulf water is like having an aquarium at your feet. You’ll delight in our spectacular beaches (voted “safest in the country” and among the top ten best in the country) and the expansive waters of Choctawahatchee Bay. Discover miles and miles of pure playground for shell-seeking, sun bronzing, sand castle building, soul searching, and surrendering to sun-drenched solitude. Protect Sand Dunes, Please: Do not walk or play on the dunes, at any time. Never walk on beach vegetation, always use the designated beach access. Dunes are built slowly over hundreds of years, but are very fragile. They are our primary defense against hurricane damage, and are a shelter for beach wildlife. Protect Sea Turtles: Sea Turtles are an endangered species. They lay their eggs along the Beaches of South Walton. Avoid the use of flashlights near nests in the evening, do not leave beach chairs and other items on the beach overnight (they block the turtles’ path), and keep your distance if you see turtles or eggs. Sea turtles are protected by federal and state law and substantial fines and federal imprisonment may result from killing, harming, or even interfering with a sea turtle. Dogs: For safety reasons dogs are not allowed on the beaches in Okaloosa County. This policy is mandated by County Ordinance No. 77-19, Section 6, restricting dogs in public parks, beaches, school grounds, restaurants and food stores (except seeing eye & hearing ear dogs). Littering: No littering on the beach and no glass containers on the beach. Trash receptacles are provided at all public beach access points. Alcohol: Alcohol is allowed on the beach except in the state parks. Again, no glass. Underage drinking is not permitted. Vehicles: Here in the Destin/Fort Walton Beach area we promote optimal safety measures for our beaches. Vehicles are not permitted on the beach, County Ordinance No. 80-12, which restricts motor vehicles operating in areas not posted for vehicular traffic, in, on or over any public land, right of way, or recreational areas (public beaches included). Bonfires: Fires are illegal on the beach between the water’s edge and mean high water mark or vegetation line, whichever is further. Okaloosa County Ordinance 79-41. Sand Removal: It is unlawful to remove sand from the beach. Camping: Overnight camping is prohibited. Fishing from the Shoreline – A saltwater fishing license is required by all anglers who fish in saltwater. This includes each person fishing from a pleasure craft, on a sandbar or any other land mass accessible by boat or by swimming through water deeper than four feet. You should contact the Okaloosa County Tax Collector’s office at 850-651-7300 or you may purchase a license online. Destin has always been known as one of the finest fishing locations in the world so it is no surprise we are referred to as the “World’s Luckiest Fishing Village.” With the largest fishing fleet in the State of Florida, we offer a wide variety of fishing from deep sea fishing to bay fishing. There are unlimited ways to fish in the Destin Area. Deep sea fishing, bay fishing and surf fishing are all popular pastimes, with Destin sporting the largest fishing fleet in the State of Florida. There are over 100 charter boats to choose from ranging in size from 6 passenger capacity to over 100. A huge variety of fish including red snapper, grouper, triggerfish, scamp, amberjack, cobia, blackfin tuna, king mackerel and more are found in the area. The highlight of the fishing community is the annual Destin Fishing Rodeo that runs from October 1 through October 31 each year. For 51 years fishermen from all walks of life compete in over 30 different categories for more than $100,000 in prizes. All saltwater game is eligible so everyone has an equal chance to win. Destin also features other fishing tournaments including the Cobia Tournament in March and April, and the annual Destin / Ft. Walton Beach Sportfish Tournament. Average Size: 3/4 – 6 lbs. Average Size: 1 – 60 lbs. Average Size: 1 – 40 lbs. Average Size: 5 – 350 Lbs. Average Size: 1 – 5 lbs. Average Size: 3 -50 lbs. Average Size: 8 – 75 lbs. Average Size: 5- 60 lbs. Average Size: 20 – 90 lbs. Average Size: 45- 550 lbs. Average Size: 1 – 65 lbs. Average Size: 3 – 21 lbs. Average Size: 1/2 – 20 lbs. Average Size: 10 – 92 lbs. Average Size: 1/2 – 55 lbs. Average Size: 1/2 – 8 lbs. Average Size: 1 – 12 lbs. Average Size: 4 – 25 lbs. Average Size: 3 – 90 lbs. Average Size: 3/4 – 5 lbs. Average Size: 1 – 10 lbs. Average Size: 1/2 – 4 lbs. Average Size: 1/2 – 6 lbs. The Destin area is home to some of the world’s finest golf courses. Breathtakingly beautiful settings showcase immaculate greens and sparkling water views, and Destin’s blue skies and sunshine ensure that your golfing experience is enjoyable and memorable. Built in 1978, Indian Bayou is a 27 hole course designed by Earl Stone. Directions: From HWY 98 in Destin, take Airport Road N approx. 1/4 mile, entrance is on right. In a beautiful setting, Santa Rose Beach Country Club offers 18 holes of golf. Directions: Located on Hwy 30-A approx. 1 mile W of Hwy 98 in South Walton. Kelly Plantation offers a Fred Couples signature 18 hole course. Directions: Located directly on Hwy 98 1 mile west of the Mid-bay bridge. Directions: Located directly on Hwy 98 2 miles east of the Mid-bay bridge. Designed by Robert C.Walker, Regatta Bay boasts 18 holes of golf. Directions: Located directly on Hwy 98 1/4 mile east of the Mid-bay bridge. Designed by Bob Cupp, Emerald Bay boasts 18 holes of golf. Directions: Located directly on Hwy 98 1 1/2 miles east of the Mid-bay bridge. An 18 hole John Lee creation. Directions: Located directly on Hwy 98 4 miles east of the Mid-bay bridge. Located on Emerald Coast Pkwy in Destin. Pristine white sugar sand beaches and more than 6,000 feet of scenic shoreline border the emerald waters of the Gulf of Mexico. Boardwalks provide access to the beach for swimming, sunbathing, and fishing, while protecting the fragile coastal dunes. Hiking along the nature trail provides visitors a rare glimpse of the coastal dune ecosystem and abundant wildlife. Full facility campsites have access to an air-conditioned and heated bathhouse facility, a separate beach access boardwalk with outdoor showers, and a playground. Natural features of the park include sand pines, scrub oaks, and dune rosemary. Campers can enjoy a breathtaking view of dolphins leaping through the Gulf waters at sunset – the perfect ending for a day at the beach. Ancient Moss-draped live oaks dominate the lawns. Camellias and azaleas offer colorful accents to the scene from October through May; enjoy the peak bloom around mid- March. The grounds, gardens and picnic area are open daily from 8 a.m. until sundown. The house is open for hourly guided tours from 9 a.m. – 4 p.m. Thursday through Monday. A nominal fee is charged for tours. A picnic area with adjacent parking is available at the old mill site on Tucker Bayou. Topsail Hill State Preserve is named after Topsail Hill, a high, picturesque dune standing 25 feet above sea level. Biking, Swimming, Fresh water fishing, Nature trails, Picnic areas. Facilities available include a pavilion, public restrooms, camping area, picnic areas and a boat ramp to Western Lake. Canoe rentals for lake tours are available. This children’s playground park and equipment were made possible through public and city donations. This is a 3.55 acre park. Amenities include a waterfront gazebo, pier, pavilion, beach swim area, playground, and picnic area. The pavilion is available for rental to private organizations and individuals by calling the Community Center at 654-5184. A refundable cleaning deposit is required. This is a 3.9 acre youth sports facility which includes one major league field, one girl’s softball field, one tee ball field, bleachers, bathrooms and a concession stand. This park is maintained by the Destin Little League. This is a low impact facility which includes a waterfront deck area with benches and picnic tables, bike rack and handicap parking. This park opened in August 2000. Future development could include access to the water and a fishing pier. This is a 1.5 acre high-impact facility with five boat launch ramps and parking area. There is a $10 daily launch fee, however residents that live within the City limits of Destin may obtain a free decal by providing proof of residency, picture ID, and boat and trailer registration. For more information please call the Community Center at 654-5184. This linear park provides public beach access to the Gulf of Mexico from Scenic US Highway 98 adjacent to the Silver Shells Condominiums. This is a 3.013 acre low impact park which includes a nature walk, benches, swing, and bicycle rack. This park provides the neighborhood a peaceful open space to enjoy nature. This is a .75 acre waterfront park. Main Street Park is a small ADA accessible park that includes a fishing pier and picnic facilities. This parcel has been dedicated parkland since the early 1950s. This is a 10.13 acre bayou access park. Amenities include a pier, beach area and picnic area. Destin and the surrounding area offers world-class shopping, with unique boutiques, famous names, department stores, beach-inspired outlets and much more to choose from. With the nation’s largest designer outlet mall and the upscale shopping environment of Destin Commons, there’s a shopping experience to suit all tastes and budgets in Destin. Silver Sands Factory Stores, located just east of Destin, FL, offers over 100 factory direct stores and 450,000 square feet of retail space filled with designer merchandise at up to 75 percent off retail price. The five million plus shoppers a year can choose from such stores as Polo Ralph Lauren, Banana Republic, Brooks Brothers, Eddie Bauer, Jones New York, Bose, Coach, Liz Claiborne, Tommy Hilfiger, Lenox, Nike and Reebok – just to name a few. A destination unto itself, Silver Sands Factory Stores features choices galore and an enjoyable setting, perfect for that shopping getaway. Silver Sands is conveniently located eight miles east of Destin on U.S. Hwy 98 near Sandestin Golf and Beach Resort. For more information, call the center office at (850) 654-9771. Emerald Coast Magazine. The 25 acre center is anchored by Bass Pro Worldwide Sportsmen, Belk and Rave Motion Pictures’ 14-screen stadium styled movie theatre. Destin Commons also offers shoppers a prize mix of more than 75 stores and restaurants. Eighty percent of the stores are regional and national, and making their first appearance in NW Florida. Dining options are abundant from casual to fine dining. They include Blue Point Fish Club, Bogwalk, Coldstone Creamery, Hard Rock Café, Johnny Rockets, Panera Bread, Starbucks, Tony’s Ristorante and Zoe’s Kitchen. It’s no wonder parents and grandparents flock to Destin Commons with their kids. Special highlights for kids include the Destin Commons Kids Club, offering special events and discounts to its members, and a nautically themed children’s soft play area with imaginative sea creatures and a lighthouse. Children can be seen year-round enjoying the 49-head pop fountain in Center Plaza. Destin Commons is located in the heart of Destin at the Mid-Bay Bridge Road and HWY 98.